About 62km (38mi) north of Campbell River on Vancouver Island via Hwy 19, turn east on a paved road and travel for 10km (5.6mi) to the village of Sayward. The Sayward Valley offers several popular local attractions and there are many activities in which you can participate ranging from whale watching to caving and kayaking. You'll enjoy the wide variety of things to do an see in this picturesque setting. Saltwater and freshwater fishing are popular activities in the area, with both steelhead and salmon available in the Salmon River. Check your fishing regulations regarding catch & release. 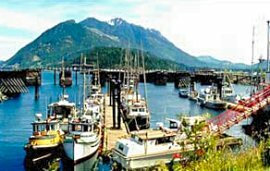 Try salmon fishing from the Government Wharf in Kelsey Bay in mid-August when the salmon are headed for the estuaries. Fishing in this manner is VERY successful here and requires nothing more than your favorite lure and a drop net. Even the latter may not be essential, since everyone is anxious to help each other when there is a strike. Or fish one of the dozens of productive lakes scattered from Campbell River to the north end of Vancouver Island. If heading to one of the wilderness lakes, be sure to leave some instruction somewhere about where you will be in these remote areas. A unique steel-frame building made entirely of used logging cable. The walls contain 8200 feet of wire rope and the building weighs almost 26 tonnes. Built by Glen Duncan, it opened as a restaurant in 1970. Enjoy a cruise up scenic Johnstone Strait to the Robson Bight Ecological Reserve on a quest to locate and observe killer whales, eagles, bears and other wildlife in their natural habitat. Local whale watching company, Robson Bight Whale Watching, offers an excursion daily from mid-June to mid-October and boasts a 90% success rate. Operating since 1989, they are Canadian Coast Guard approved and also have a gift shop. Enjoy a leisurely stroll along the pathway winding by Sayward's estuary and you'll find a variety of wildlife! Count the species of birds and other wild animals who make their home in this beautiful natural environment. Don't forget your camera! At the corner of Sabre Road, this trail rises to an altitude of 5481 ft and has many spectacular viewpoints for photographs or just catching your breath. Allow 6 hours for this trip, and it is a mountain trail, so wear and bring mountain hiking gear. Alert Bay, population 1,500, lies like a jewel cradled in the arms of Cormorant Island. The community can be reached by ferry from the northern Vancouver Island community of Port McNeill, which is just off Hwy 19 and 200 km (124 miles) North of Campbell River. This quaint little island community offers a unique glimpse of rich First Nation Culture and Heritage. Here you will find the U'mista Cultural Centre, the world's tallest Totem Pole, 'Namgis Burial Grounds, the T'sasala Cultural Group who do traditional Native Dance Performances in our Big House, Alert Bay Library-Museum, and Alert Bay Ecological Park and the many trails throughout the island. There is also fishing, whale watching and much much more. The friendliest little island on the coast has shops to browse in, people to chat with, sights to see, and lots to do. Established in 1911-12 during the building of the telegraph line from Campbell River north to the tip of the Island. Later it became a sawmill community and now is major destination for the coastal wilderness, including whale-watching tours. 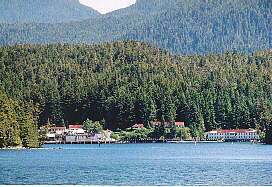 Telegraph Cove is not far from Robson Bight on Johnstone Strait. In 1982, the bight was declared a reserve to protect the orca habitat, please do not enter the reserve area. In 1965, Port Alice made history by becoming the first instant town incorporated in BC, although pulp and paper mills have operated here since 1918. This is a good place for boat launching to fish and explore the inlets along Quatsino Sound (west side of Vancouver Island). Try the nine-hole, nine sand trap, four water hazards golf course. 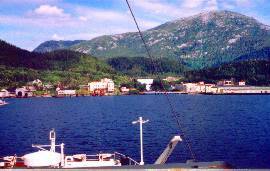 Port Alice, offers full tourist facilities. Located on Fisher Channel, it got its start with a lumber mill in 1909, that started producing paper in 1912. In the 1970's the mill was greatly expanded, but in 1981 the mill shut down. The town also lost the ferry service. This almost abandoned town, is a base for fishing, hunting and the bottling of local water from the falls and lakes in the area. 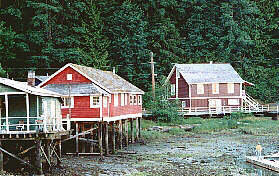 This historic native village on Burke Inlet, is west of Bella Coola and can only be reached by water. Namu is one of the oldest inhabited sites in Canada. Archaeologists are uncovering the layered story of native history for the past 10,000 years. Native sites here are protected, so do not disturb and take nothing.